Metamorphose Linux is a Brazilian Debian-based distribution whose biggest goal is being simple and complete with a pleasant graphical interface for beginners or advanced users. 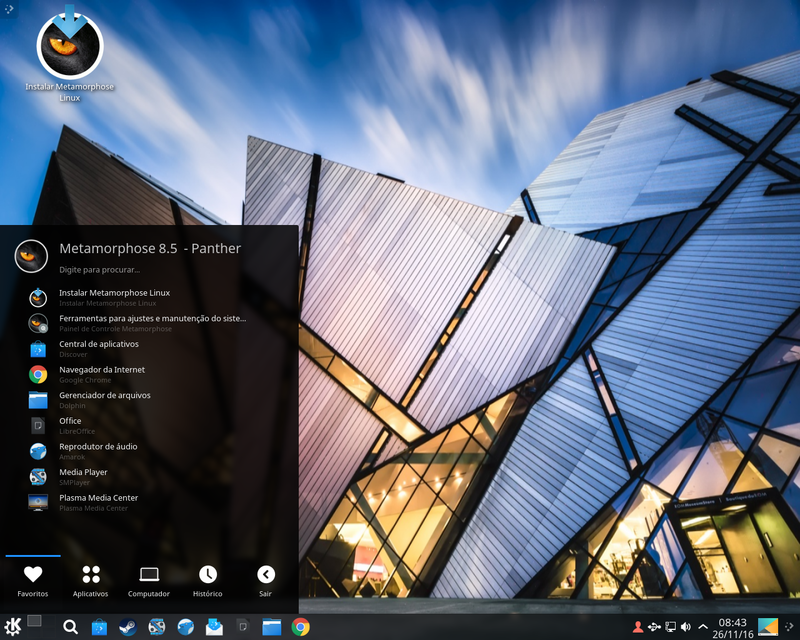 The distribution ships with KDE Plasma as the default desktop environment and WINE is present to help users run Windows applications. UEFI support is available. 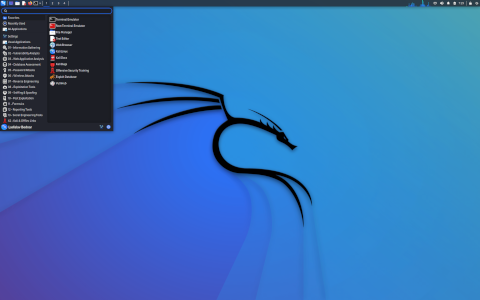 Rate this project Kali Linux is a Debian-based distribution that includes a collection of security and forensics tools. The Kali developers have released a new version, Kali Linux 2018.1, which features an updated kernel and two new security features: "Kali Linux 2018.1 has a shiny new 4.14.12 kernel. New kernels always have a lot of new features and the 4.14 kernel is no exception, although two new features really stand out. AMD Secure Memory Encryption Support - Secure Memory Encryption is a feature that will be in newer AMD processors that enables automatic encryption and decryption of DRAM. The addition of this features means that systems will no longer (in theory) be vulnerable to cold-boot attacks because, even with physical access, the memory will be not be readable. Increased Memory Limits - Current (and older) 64-bit processors have a limit of 64 TB of physical address space and 256 TB of virtual address space (VAS), which was sufficient for more than a decade but with some server hardware shipping with 64 TB of memory, the limits have been reached. Fortunately, upcoming processors will enable 5-level paging, support for which is included in the 4.14 kernel." More details can be found in the project's release announcement. Download (SHA256, pkglist): kali-linux-2018.1-amd64.iso (2,888MB, torrent), kali-linux-light-2018.1-amd64.iso (846MB, torrent). Kali Linux is a Debian-based distribution which features several security and forensics tools. The project has adopted a rolling release approach to new versions. The new release, Kali Linux 2017.1, features drivers for RTL8812AU wireless chipsets, improved GPU support and there are now Azure and AWS images of Kali Linux for cloud instances. "Finally, it's here! We're happy to announce the availability of the Kali Linux 2017.1 rolling release, which brings with it a bunch of exciting updates and features. As with all new releases, you have the common denominator of updated packages, an updated kernel that provides more and better hardware support, as well as a slew of updated tools - but this release has a few more surprises up its sleeve. A while back, we received a feature request asking for the inclusion of drivers for RTL8812AU wireless chipsets. These drivers are not part of the standard Linux kernel, and have been modified to allow for injection. Why is this a big deal? This chipset supports 802.11 AC, making this one of the first drivers to bring injection-related wireless attacks to this standard." A summary of available features in version 2017.1 can be found in the project's release announcement. Download (SHA256): kali-linux-2017.1-amd64.iso (2,664MB, torrent, pkglist).